Singer 611 Carrying Case... 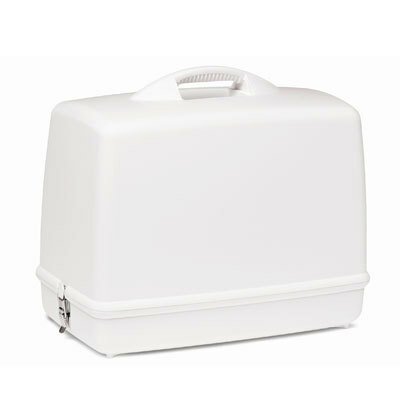 Durable impact-resistant plastic case for storing most sewing and overlock machines; Compatible with all brands of free-arm sewing and overlock machines; Dust-free environment and protection for your machine while it's not in use; Safety "sure-lock" metal latches for added protection; Lightweight for easy carrying; Durable impact-resistant plastic; Dimensions: 17"W x 8.5"D x 12"H. This item cannot be shipped to APO/FPO addresses. Please accept our apologies. SINGER 4423 Heavy Duty Machine Included Accessories General Purpose Foot Zipper Foot Buttonhole Foot Button Sewing Foot Edge / Quilting Guide Pack of Needles Bobbins Spool Caps Auxiliary Spool Pin Spool Pin Felt L-Screwdriver Seam Ripper / Lint Brush Dust Cover FEATURES Extra High Sewing Speed 1 100 Stitches Per Minute Heavy Duty Metal Frame Stainless Steel Bed Plate Top Drop-In Bobbin System 23 Built-In Stitches Fully Automatic 1-Step Buttonhole Adjustable Stitch Length and Width Automatic Needle Threader Adjustable Pressure Foot Pressure Drop Feed System 4 Snap-On Presser Feet Free Arm with Accessory Storage Horizontal Thread Delivery Extra High Presser Foot Lift Provision for Mounting in Cabinet or Table This item cannot be shipped to APO/FPO addresses. Please accept our apologies. 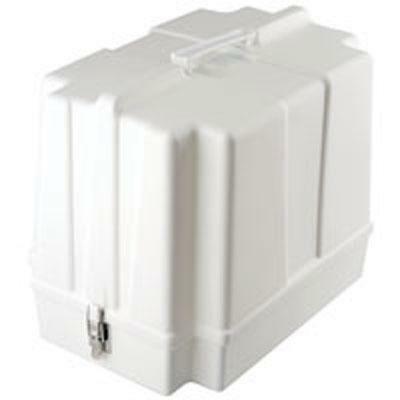 Brother Universal Sewing Machine Case - 2-piece carrying and storage case. Fits any free-arm sewing machine and most sergers. Molded from durable but lightweight plastic. Locking metal side hinges; built-in handle; stay-clean surface. Both the machine (CS6000I) and extension table (separated) will fit into the 5300 case This item cannot be shipped to APO/FPO addresses. Please accept our apologies. 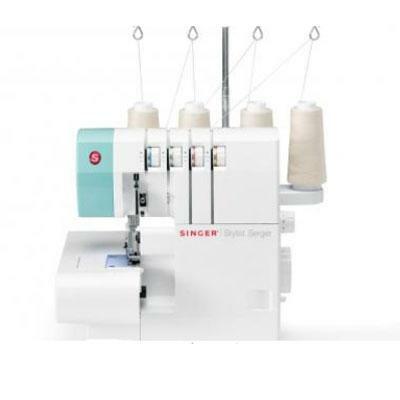 The SINGER 7469Q Confidence Quilter machine has many advanced features including the Drop and Sew - bobbin system programmable needle up/down drop feed twin needle capability and push-button stitch selection so sewing and quilting is enjoyable. The 7469Q boasts 98 stitch patterns and standard accessories including popular quilting presser feet. Included Accessories: General/All Purpose Foot Zipper Foot Satin Stitch Foot Blind Hem Foot Buttonhole Foot Even Feed/Walking Foot Darning & Embroidery/Stippling Foot Open Toe Foot Straight Stitch Foot Needles Bobbins (4) Auxiliary Spool Pin Felt Discs (2) Spool Caps (3) Seam Ripper/Brush Screwdriver Extension Table Foot Pedal Power Cord Instruction Manual. This item cannot be shipped to APO/FPO addresses. Please accept our apologies. 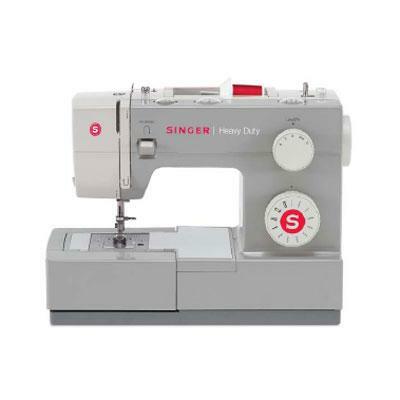 SINGER 4411 Heavy Duty Machine Included Accessories General Purpose Foot Zipper Foot Buttonhole Foot Button Sewing Foot Edge / Quilting Guide Pack of Needles Bobbins Spool Caps Auxiliary Spool Pin Spool Pin Felt L-Screwdriver Seam Ripper / Lint Brush Dust Cover FEATURES Extra High Sewing Speed -1 100 Stitches Per Minute Heavy Duty Metal Frame Stainless Steel Bed Plate Top Drop-In Bobbin System 11 Built-In Stitches Automatic 4-Step Buttonhole Adjustable Stitch Length & Width Adjustable Pressure Foot Pressure Drop Feed System 4 Snap-On Presser Feet Free Arm with Accessory Storage Horizontal Thread Delivery Extra High Presser Foot Lift Provision for Mounting in Cabinet or Table This item cannot be shipped to APO/FPO addresses. Please accept our apologies. 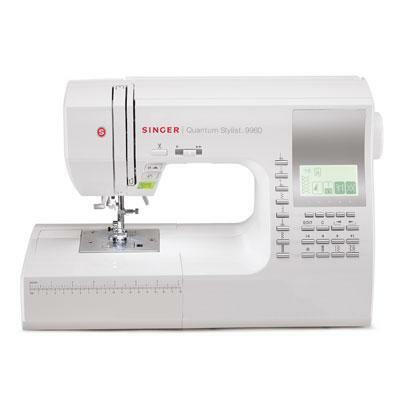 SINGER 9960 Quantum Stylist Computerized Sewing Machine - Automatic needle threader and top drop-in bobbin system make for quick and easy set-up. 600 built-in stitches including 13 styles of fully automatic one-step buttonholes and 5 different fonts provide endless project possibilities. Stitch editing capabilities allow you to control the exact look of a stitch pattern with elongation and mirror imaging. One-touch automatic thread cutter trims the upper and lower threads when you are done sewing for faster and easier sewing. Electronic auto pilot and speed control provide complete control of sewing speed making sewing difficult areas easier and error-free. This item cannot be shipped to APO/FPO addresses. Please accept our apologies. 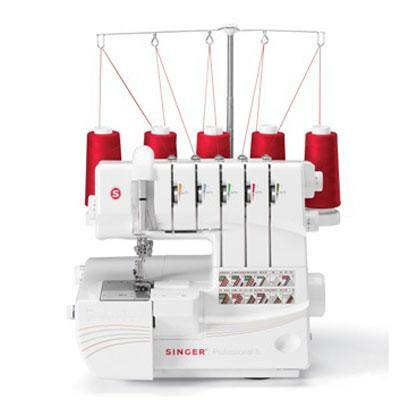 The SINGER 14CG754 ProFinish a 4/3/2 thread overlock machine that saves you time with hems seams and seam finishing. Sewing at 1 300 stitches per minute while trimming and overcastting you will zip through numerous projects. 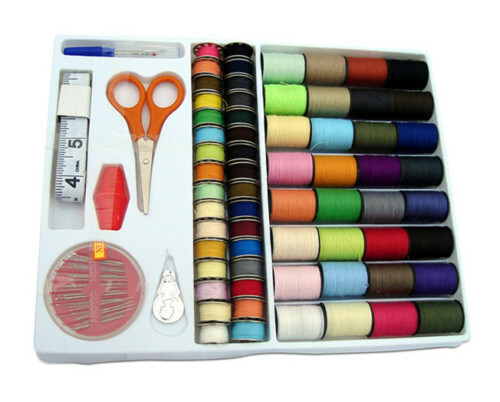 It includes an adjustable cutting width stitch length control and color-coded lay-in threading. Included Accessories: standard foot needles tweezers screwdriver and spreader. Included Stitches: Four-thread stretch mock safety stitch Three-thread overlock Three-thread wrapped edge Three-thread rolled hem Three-thread flatlock Two-thread wrapped edge Two-thread rolled hem This item cannot be shipped to APO/FPO addresses. Please accept our apologies. Brother CS-8800PRW Computerized Sewing Machine Project Runway - Featuring a wide array of professional features in a lightweight easy-to-use package the CS8800PRW is a Project Runway Limited Edition computerized sewing machine featuring 80 unique built-in stitches including 8 styles of one-step auto-size buttonholes. 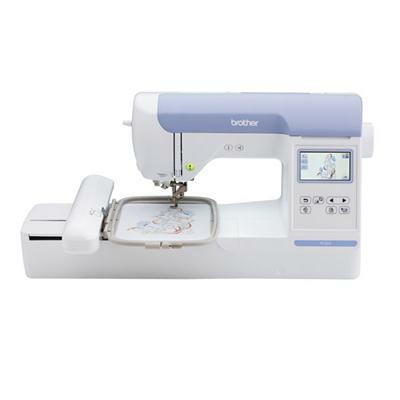 Sew with style as you take advantage of the LCD display stitch selection screen and the super bright LED-lit work area. Effortlessly thread your machine with the Advanced Needle Threading System and begin sewing almost immediately utilizing the Quick Set™ Drop-in Top Bobbin setting system. 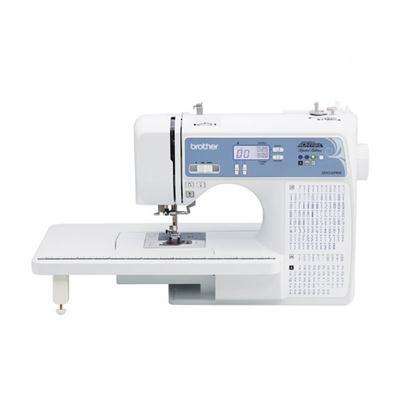 The CS8800PRW is a Consumers Digest Best Buy and will give you many years of quality service whether you are doing basic mending garment construction or even heirloom sewing. Become the fashionista you always dreamed of! This item cannot be shipped to APO/FPO addresses. Please accept our apologies. 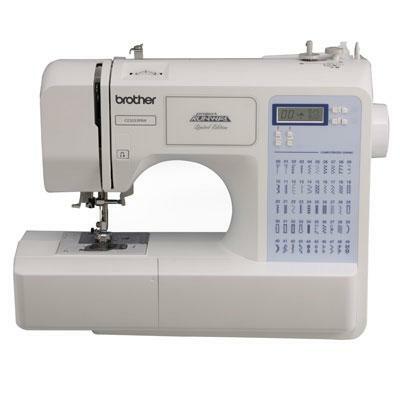 Brother 1034D 3 or 4 Thread Serger with Easy Lay In Threading with Differential Feed - Reliable high performance 3/4 thread serger delivers professional edge finishing on a wide range of fabrics including knits linens and formal wear. Create ruffles decorative edges gathers; join laces; serge narrow sleeves spaghetti straps and more! 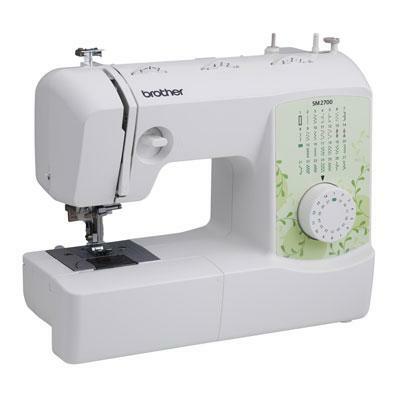 22 built-in stitch functions with 4-thread overlock 3-thread overlock narrow rolled hem and ribbon lock stitches with specialty stitch functions for formal and bridal wear home decor and crafts heirloom and reinforced tape applications. Differential fabric feed; for truly professional even stitch quality even on thin knitted and stretchy fabrics. Easy to thread easy to learn and use; with included instruction video printed manual and completely color-coded and numbered upper and lower looper threading. Includes free phone support for the life of the product and a 25-year limited warranty. Comes complete with 2 snap-on feet foot controller soft cover n This item cannot be shipped to APO/FPO addresses. Please accept our apologies. 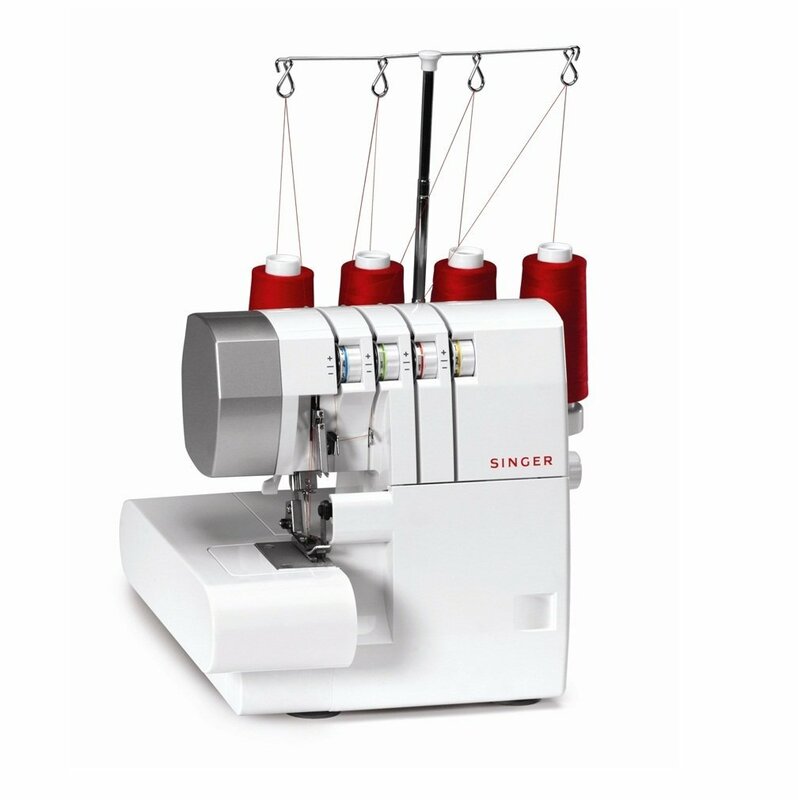 The SINGER Professional 5 serger has 5/4/3/2 Thread Capability and sews 1.300 Stitches per Minute. With its Fully Automatic Self Adjusting Tension System and Color Coded Lay-in Threading set-up is simple! This serger has a built-in rolled hem an extra-high presser foot lifter and six additional feet! Included Accessories: Screw Driver (large) Elastic Foot Allen Screwdriver Blind Hem Foot Knife (stationary) Shirring Foot Spool Cap Beading Foot Anti-spill Net Cording Foot Oiler Taping Foot Brush All Purpose Foot Tweezers Spreader Needles Cone Adapters Machine Cover Clean Pocket and CD workbook. This item cannot be shipped to APO/FPO addresses. Please accept our apologies. Singer Stylist Serger with 2-3-4 thread capability provides more stitch variety (blind hems rolled hems flatlocking finished raw edges and joining seams) Differential feed keeps knits from stretching and lightweight fabric from puckering 4 built-in rolled hems provide more hem options especially for lightweight fabrics 1 300 stitches per minute provides professional speed for faster results Adjustable tension keeps stitches balanced and even Adjustable stitch length and width keeps seams strong and prevents bunching on any type of fabric Easy color coded lay-in threading system makes threading the machine easier Removable free arm allows you to sew difficult to reach areas such as cuffs and sleeves Easy threading diagram shows how easy it is to thread the machine Extra-high presser foot lifter offers more clearance when sewing multiple layers of fabric The moveable upper knife gives you the option to stitch and not trim the fabric Machine Dimensions: 11.5" L x 11" W x 10.75" H Weight: 1 This item cannot be shipped to APO/FPO addresses. Please accept our apologies. Create sew and quilt - easily and affordably! 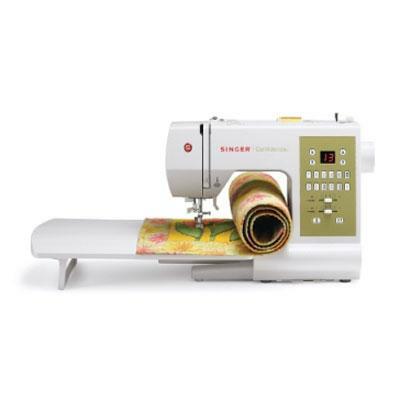 User-friendly and portable the CS6000i offers a wide range of sewing and quilting features all at a price that's easy on your budget. 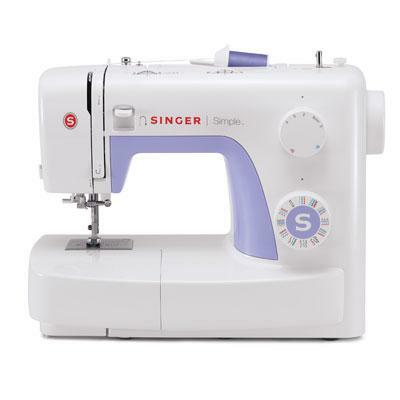 Select from 60 built-in sewing stitches including decorative stitches and 7 styles of one-step buttonholes; choose from the 9 included presser feet; use the detachable oversized table for larger projects; and take your machine with you to classes with the included hard carry case. The CS6000i is designed for ease of use with its easy-to-view LCD display automatic needle threader easy-to-follow threading diagrams and adjustable sewing speed control. Included are a printed Quick Start guide and a complete instructions manual in English and in Spanish. 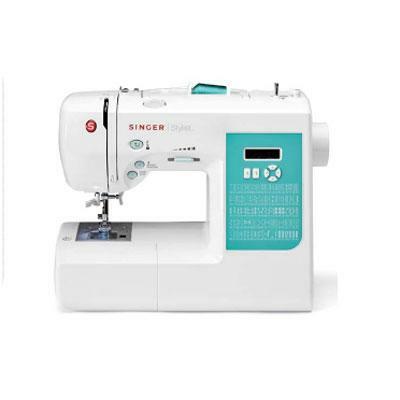 Enjoy sewing quilting and crafting with the incredibly value-packed CS6000i sewing machine! Features: LCD display with easy-to-use stitch selector. 60 built-in stitches including and 7 styles of 1-step auto-size buttonholes. Automatic needle threader. Super easy bobbin This item cannot be shipped to APO/FPO addresses. Please accept our apologies. Brother PE770 5" x 7" Embroidery-only machine with built-in memory USB port 6 lettering fonts and 136 built-in designs - Expansive 5" x 7" field and back lit LCD display screen. Enjoy ample space for larger designs and lettering and combine designs with less rehooping. Easily view your designs and editing options on the large back lit display before stitching. 136 built-in embroidery designs and 6 lettering fonts. Designs include beautiful scrollwork florals and quilt patterns; plus 10 frame shapes and 12 border styles. Virtually unlimited design options with built-in memory. Import designs from your USB memory stick with the USB port or memory card designs with the built-in card slot. Store your purchased or custom edited designs to built-in memory for future use. Extensive design editing. Rotate mirror-image increase and decrease the size of your designs and see how your edited design looks on the large easy-view back lit LCD display before stitching. Reliable easy thr This item cannot be shipped to APO/FPO addresses. Please accept our apologies. The SINGER Stylist Sewing Machine 100 stitch Included Accessories Blind Stitch Foot Buttonhole Foot Darning & Embroidery Foot Overcast Foot Rolled Hem Foot Straight Stitch Foot Zipper Foot Bobbins Darning Plate Needles Screw Driver Seam Ripper/Brush Spool Caps Spool Pin FEATURES 100 Stitch Patterns 6 Fully Auto 1-step Buttonholes Adjustable Stitch Length & Width Automatic Needle Threader Top Drop-in Bobbin Programmable Needle Up/Down Sewing Speed Control Push Button Stitch Selection LED Work Light Heavy Duty Metal Frame 25 Year Limited Warranty This item cannot be shipped to APO/FPO addresses. Please accept our apologies. 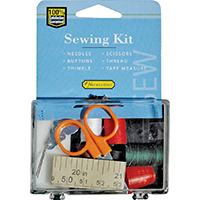 Tivax FS092 101 pcs sewing kit Sewing Kit-FS092 100 items included: - 32 thread spools with different colors. - 32 Bobbins different color thread. - 1 thimble (red one). - 1 threader: it help the thread to get through into the needles (the silver one). - 1 seam ripper: it helps to remove stitches possible with less likelihood of ruining fabric (the yellow one). SINGER 3323 Talent Sewing Machine with Automatic Needle Threader; Adjustable Stitch Length & Width - keep seams strong and prevent bunching on any fabric; 1 Fully-Automatic 1-Step Buttonhole - professional results at the touch of a button; Top Drop-In Bobbin - easy in and out bobbin for quicker threading; 23 Built-In Stitches - essential decorative & stretch. Accessories include Extra-High Presser Foot Lifter - extra clearance when using layers of bulky fabric Free Arm with Accessory Storage - easily sew sleeves and cuffs All Purpose Foot Zipper Foot Buttonhole Foot Button Sewing Foot Edge/Quilting Guide Pack of Needles Bobbins Spool Caps Auxiliary Spool Pin Spool Pin Felt Darning Plate L-Screwdriver Seam Ripper/Lint Brush Soft-Sided Dust Cover. This item cannot be shipped to APO/FPO addresses. Please accept our apologies. Brother CS-5055PRW Computerized Sewing Machine Project Runway - 50 built-in utility decorative and heirloom stitches each with multiple stitch functions. Sew fleece elastic and other stretchy fabrics with the built-in stretch stitches. One-step bobbin replacement with quick set drop-in bobbin. Embellish or join quilt blocks with the built-in quilting stitches. This item cannot be shipped to APO/FPO addresses. Please accept our apologies. 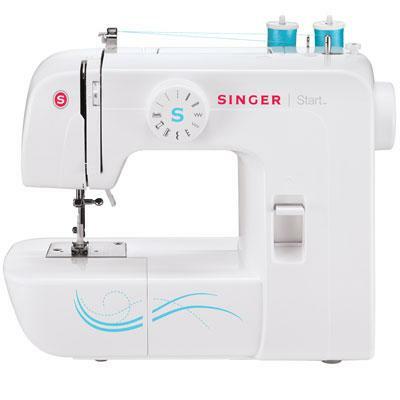 The SINGER 1304 START Basic 6-Stitch Sewing machine includes a straight stitch satin stitch zig zag stitch scallop stitch blind hem stitch and a 4-step buttonhole. This machine features Easy Stitch Selection allowing you to change stitches in one easy step Easy Threading diagrams printed right on the machine so you can be set-up in no time Automatic Tension to ensure stable straight stitch quality regardless of fabric type and Preset Stitch Length and Width makes it so there is no need to make any stitch length and width adjustments. White Light blue decal on front This item cannot be shipped to APO/FPO addresses. Please accept our apologies. 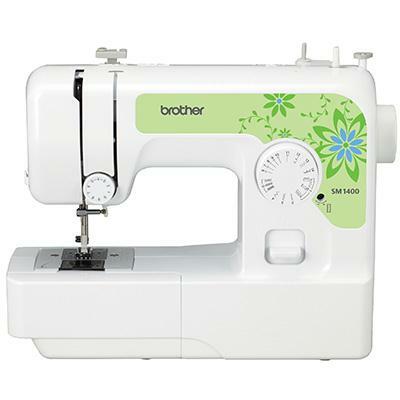 This reliable user-friendly Brother sewing machine is ideal for everyday sewing and mending. The SM1704 offers the features of a full size machine yet is lightweight and portable. Included are 17 unique stitches for blind stretch buttonholes and zipper insertion. Selecting your stitches is as easy as turning the dial and the tension control dial and reverse sewing lever give you addes control at your fingertips. 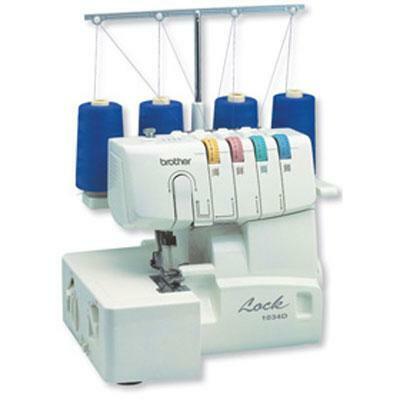 This machine also has the reliable Brother jam-resistant Quick-set drop-in top bobbin. English and Spanish product manual with 25 year limited warranty. Bullet Points: 17 Built-in Stitches with 38 Stitch functions - Lightweight and full size sewing machine perfect for everyday sewing and mending - Auto-size 4-step buttonholer included - Easy to use jam-resistant Quick set drop-in top bobbin - Built-in accesory storage - Instructional DVD included - Free technical phone and online support for the life of the product. This item cannot be shipped to APO/FPO addresses. Please accept our apologies. 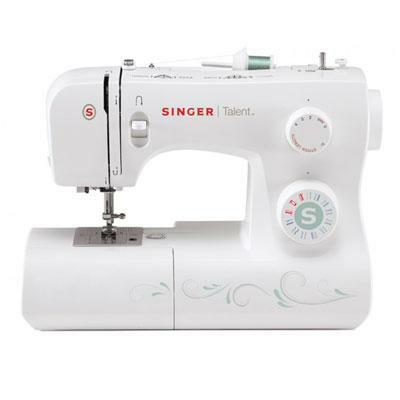 SINGER 3232 Simple Automatic Needle Threader 32 Built-In Stitches 1 Fully Automatic 1-Step Buttonhole. Features: 32 Built-In Stitches with stitch guide included in the manual. Automatic Needle Threader - sewing's biggest timesaver! 1 Fully Automatic 1-Step Buttonhole - professional results at the touch of a button. Adjustable Stitch Length & Width helps keep seams strong and prevents bunching. Heavy Duty Metal Frame for overall durability and skip-free sewing. Free Accessories included. Quick Start Guide included for easy start up. Machine Intro DVD included for a complete introduction to your machine. FREE Accessories Included: All-Purpose Foot Zipper Foot Buttonhole Foot Button Sewing Foot Seam Ripper / Lint Brush Edge / Quilting Guide Pack of Needles Auxiliary Spool Pin Bobbins (Class 15) L-Screwdriver Darning Plate Soft-Sided Dust Cover Instruction Manual Maching Intro DVD Foot Control Power Cord. Unit Weight: 12.6lb Dimensions: 15" L x 7.5" W x 12" H This item cannot be shipped to APO/FPO addresses. Please accept our apologies. CRICUT MAKER BLUE This item cannot be shipped to APO/FPO addresses. Please accept our apologies. 110 built-in sewing stitches including many beautiful decorative satin and quilting stitches with 8 styles of 1-step auto-size buttonholes. 1 font with 55 alphanumeric stitches for basic monogramming. 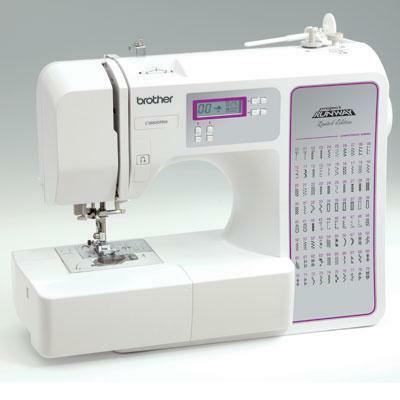 View your stitches on the large back-lit LCD display and use the push-button controls to easily adjust the stitch length and width This item cannot be shipped to APO/FPO addresses. Please accept our apologies. 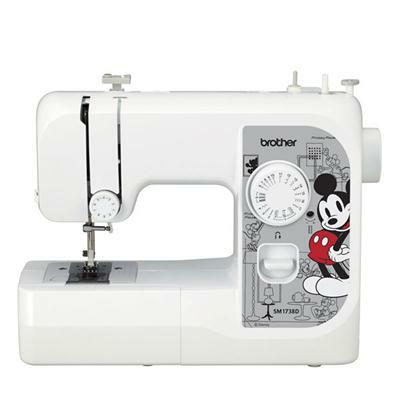 Brother 17-Stitch Full-size sewing machine with Disney Fashion faces. 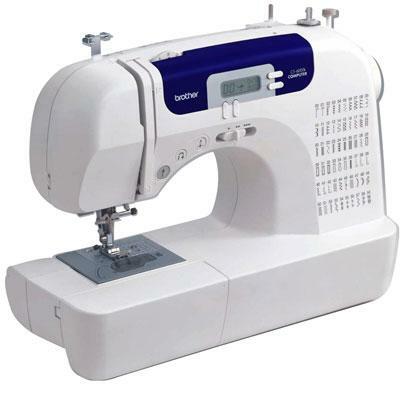 Full size full-featured sewing machine perfect for everyday sewing and mending. Customize your machine in minutes by switching between the included Frozen Minnie Mouse and Disney Princess faceplates. This item cannot be shipped to APO/FPO addresses. Please accept our apologies. 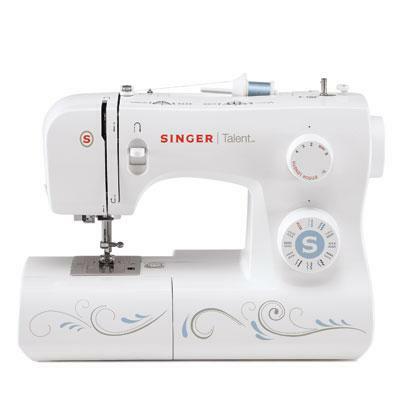 Singer 3321 Talent 21-Stitch Essential Sewing Machine with Automatic Needle Threader and Drop-In Bobbin This item cannot be shipped to APO/FPO addresses. Please accept our apologies. 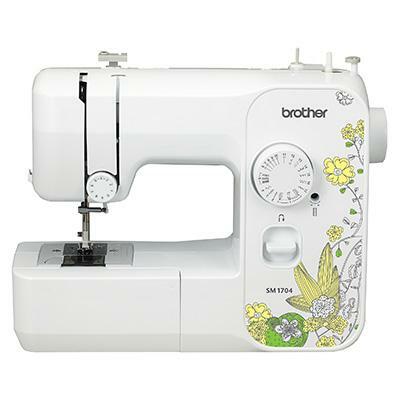 Brother 27 Built-in Utility Decorative and Heirloom Stitches. Automatic Needle Threader. Automatic 1-step Buttonholer. Quick set top drop-in bobbin. Forward and Reverse sewing. Green. This item cannot be shipped to APO/FPO addresses. Please accept our apologies. 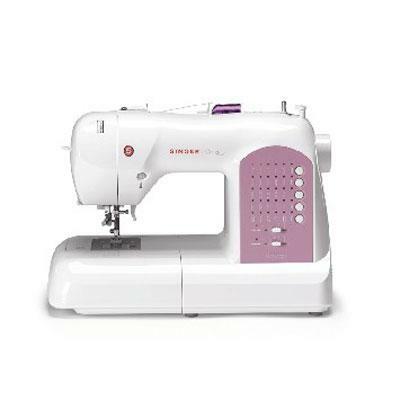 The SM1400 offers the perfect set of features for everyday sewing and mending. Lightweight yet full-sized this machine can easily fit on a table or desk.Included are 14 stitches for blind hems stretch stitches buttonholes and zipper insertion. Quick-set top drop-in clear-view bobbin cover with automatic winding system. English and Spanish user manual with 25-year limited warranty. Bullet points: 14 Built-in Stitches - Automatic 4-step buttonholer - Bright LED sewing light - Flatbed/free arm convertible sewing surface - Built-in accesory storage - Electronic speed control - forward and reverse sewing - Instructional DVD included - quick-set bobbin system - top load horizontal bobbin This item cannot be shipped to APO/FPO addresses. Please accept our apologies. 5"x7" embroidery field provides plenty of space for larger designs and lettering and allows you to combine designs with less rehooping. Includes a 5"x7" hoop embroidery arm and embroidery foot. Large 3.2" Sew Smart color LCD touch screen display allows you to view your designs in full color before stitching. 138 built-in embroidery designs including beautiful decorative alphabet borders holiday florals and kids designs. 7 embroidery lettering fonts for personalizing your creations. This item cannot be shipped to APO/FPO addresses. Please accept our apologies. 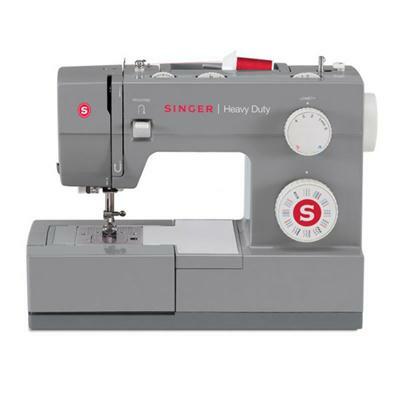 The SINGER 4432 Heavy Duty sewing machine is a true workhorse. 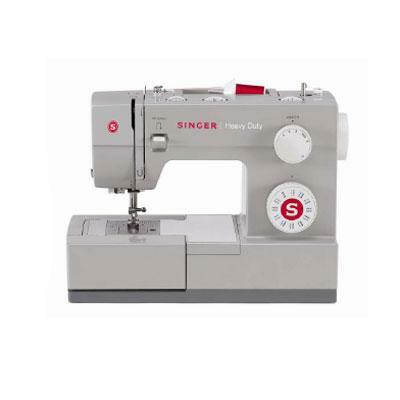 Featuring a heavy duty metal interior frame stainless steel bed plate extra-high sewing speed (1100 stitches per minute) and a powerful motor the 4432 Heavy Duty machine can so through just about anything you need to sew. This machine features an automatic needle threader and an automatic 1-step buttonhole. Drop feed for free motion sewing adds a new dimension to the ease of the 4432 Heavy Duty sewing machine. 32 built-in stitches feature essential stretch and decorative stitches. Free accessories include a pack of needles bobbins spool caps auxiliary spool pin spool pin felt screwdrive seam ripper/lint brush and a soft-sided dust cover. Grey/Red Decals on front. This item cannot be shipped to APO/FPO addresses. Please accept our apologies. Even for those just learning to sew the SINGER FASHION MATE 3333 sewing machine will get you sewing in no time. Check out the FREE Online SINGER Owner's Class and the SINGER Sewing Assistant App (available for both iOS and Android devices)! All for you from the experts at SINGER. 23 Stitches. Top Drop-In Bobbin. Built-In Needle Threader. Heavy Duty Metal Frame. STAYBRIGHT LED Light. 4-Step Buttonhole. White. This item cannot be shipped to APO/FPO addresses. Please accept our apologies. 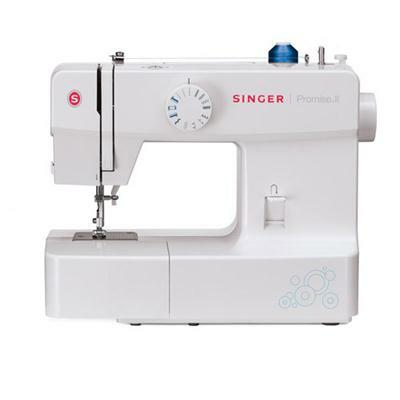 The SINGER PROMISE II sewing machine includes all the essential features you need to get off to a great start! 13 built-in stitches include an automatic buttonhole with easy stitch selection with adjustable stitch length allow your imagination to become reality. Easy machine threading and an automatic bobbin winder make set-up a breeze. A reverse lever is right at your finger tips for automatic stitch locking. Four included presser feet (all-purpose buttonhole button sewing and zipper) are easily accessible in the accessory storage drawer that can be removed to create a free arm for stitching in hard-to-reach areas. Adjustable Tension. Automatic Presser Foot Pressure. Heavy Duty Metal Frame. Snap-on Presser Feet. White This item cannot be shipped to APO/FPO addresses. Please accept our apologies. 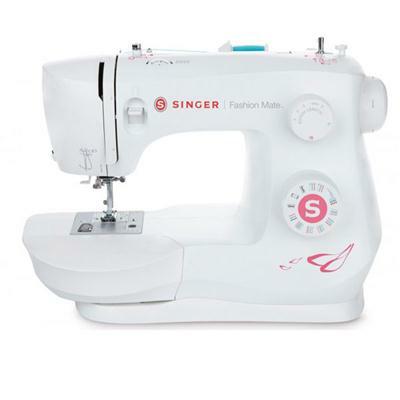 The SINGER 8763 Curvy features the innovative Swift Smart Threading System that has one touch threading! The Drop & Sew - bobbin system 30 stitch patterns including two fully automatic one-step buttonholes and optimum stitch settings are just a few of this machine's features. Included Accessories: General/All Purpose Foot Zipper Foot Satin Stitch Foot Blind Hem Foot Buttonhole Foot Needles Bobbins (4) Auxiliary Spool Pin Felt Discs (2) Spool Caps (3) Seam Ripper/Brush Screwdriver Darning/Feed Cover Plate Foot Pedal Dust Cover Power Cord Instruction Manual. This item cannot be shipped to APO/FPO addresses. Please accept our apologies.